* In the 80th of the last century the special stage, which runs between the villages of Ruska and Dolishniy Shepit (the road leading through Shurdin pass), was part of the road of «Karpaty Rally», owing the status of the Ukrainian SSR Cup. * Total distance of rally «Karpaty-87» was 666.01 km, among of them 156.68 km of specials. * In Soviet times, the race started in Kosiv, two days later, having passed Vyzhnytsya, Yavoriv, Vorokhta, Yaremche, Delyatyn, Kalush and Bodnar, the drivers were returning back in Kosiv, for the awards ceremony. * The highest point of Shurdin pass is at an altitude of 1173 meters above sea level, making it the most mountainous road pass in Ukraine. * The length of special stage, passing through Shurdin always was 20 km, as it is impossible to reconfigure the narrow mountain roads. In spite of it since 2011 organizers make it longer using the plain part of the road. * If you take into account only sharp turns (turns over 90 degrees), Shurdin pass offers 21 – 11 Left and 10 Right, if driving from the Shepit to Ruska. * For the first time in the history of Ukrainian rally its opening National Cup was held in Chernivtsi region in 2006. Since then, it had been held: four rallies «Bukovina» (2006, 2007, 2009 and 2010), one rally «The Golden Autumn Of Carpathians» (2006), single rally «Chernovtsy-600» (2008) and one «Aleksandrov Rally». In addition, some Bukovina stages bypassing Shurdin, had been used for «Bukovina Winter» Cup races (2008 and 2009). * In six years of the modern history of Bukovina Rally (2006 – 2011) the Shrudin pass was overcame 26 times in both directions. 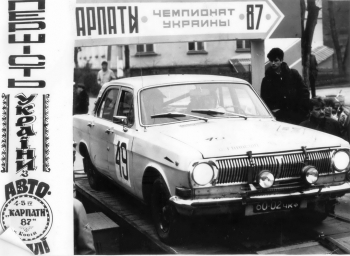 Aleksander Salyuk Junior won this special stage 24 times; the two victories had been recorded by his father, Aleksander Salyuk Senior. * The minimum number of participants in Bukovina Rally was recorded in 2006 – 19 crews, the largest in 2009 – 38 crews.